The need for efficiency in the supply of the food manufacturing industry is integral to meet the ever-increasing market demands. Global population rise is placing more pressure on our food supplies. In the UK alone the expected rise in population to 70 million is leading the food manufacturing industry to grow: 140,000 new recruits are expected by 2024. With food and drink contributing to £28.2 billion to the UK’s economy, making it the biggest manufacturing sector in the country, the demand for high-quality products has resulted in an industry demand for high-quality production and management systems. 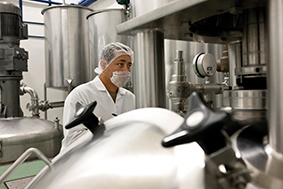 Food processing companies are now calling for scientifically and mathematically accurate, ergonomic, innovative, technology that is designed to improve maintenance and safety management systems, exemplified by the case studies below. the liquid level of apple puree inside the large tanks, which was affecting their efficiency. Keen to find a solution, the team reached out to Coltraco Ultrasonics. A site visit was conducted by Lubomir Ernst, the firm’s central & eastern European regional director. After a short trial he was able to assess that advanced portable ultrasonic liquid level indication technology was efficient in quickly and accurately gauging the liquid level of apple puree within the vessel. The implementation of an ultrasonic liquid level indicator allows the plant to run more efficiently and reduces risks by providing the staff with a means of accurately and non-invasively monitoring the contents within the apple puree tank. Ultrasonic technology is an effective and reliable technology for identifying a wide range of liquids in cylinders/tanks, saving time and cost whilst increasing efficiency and safety. In another case study that highlights the benefits of ultrasonic technology, a food processing factory based in the south of the UK approached Coltraco Ultrasonics after having difficulty with its containment of mayonnaise. The company produces coleslaw, packaged salads and pastas for the likes of McDonalds, Tesco, Morrisons and Lidl, producing over 130,000 pots of coleslaw a day. It faced difficulty in monitoring the contents of its mayonnaise and Coltraco offered a solution to this problem. The mayonnaise used for the coleslaw is contained in 2.2.m high stainless steel cylinders. However, the monitoring method that the factory used to check usage and remaining contents was through employees manually using ladders to peer into the cylinder and make an assumption of how much was left. Three issues arise with this method: potential contamination of the mayonnaise; inaccurate measuring methods; and health and safety risk to the operator. The Food Standards Agency and the Hazard Analysis Critical Control Point (HACCP) supplies stringent regulations about contamination. There could be a high risk if there was contamination, for example from allergens and pathogens. This is a principle as required by EU food hygiene fules. It was this issue that the food production company wanted to mitigate and wanted to apply Coltraco’s technology to help adhere to its HACCP to mitigate any food safety problems. After a site visit was conducted by Coltraco engineers, a liquid level indicator was supplied to the company. This technology efficiently, quickly and accurately gauges the liquid level of the mayonnaise within the vessel using non-intrusive, clean, ultrasonic technology that emits no radiation. The implementation of the liquid level indicator allows the plant to run more efficiently and reduces risks by providing staff with a means of accurately and non-invasively monitoring the contents within the mayonnaise tank – negating the need for physical inspection using ladders. Further to the needs of the food processing factory, the trial and implementation of this unit suggested that Coltraco could develop a fixed monitoring system for this vessel type and others like it, to non-invasively, continuously monitor the contents of the condiments within the tank. This builds upon the technology that the company has designed for fire safety. It has now developed what it believes to be the first system worldwide that is capable of monitoring the liquid level of critical fire suppression cylinder systems on a constant basis. It gives a facility total visibility on the real-time status of all its critical fire systems. Using its innovation and ability to adapt technology to customer-required situations, Coltraco is developing its technology to continuously monitor the contents within the tanks, so that the food processing company can be alerted when the contents drops below a set level, thus improving efficiency, with simple and easy use for its team. With the pressures on the food industry, technology companies must provide innovative and personalised solutions to the demands that their customers have to face, so that their customers can be assured of business success and efficiency.